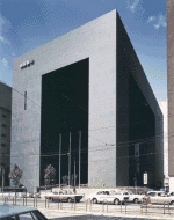 The large plaza under a large overhang belongs to the Fukuoka Bank, and is also accessible to the citizens. In this sense, it forms an intermediate space between a private space and a public space. This kind of intermediate space between exterior and interior or between private and public has its roots in traditional Japanese architecture, "Engawa". The citizens can enjoy and relax with a big tree of "Horuto" and up to 200 other trees, as well as representative sculptures of contemporary Japan. The plaza under a large overhang, especially the preliminary concept, has succeeded in the scheme of Grand Arche in Paris- La D'efense by Spreckelsen. En-space or intermediate space was created by a large overhang formed by the ninth floor of this bank. The intermediary, semi-public space thus formed prevents sharp distinctions between outside and inside, and constitutes a contrast with the Western square or plaza. The gray tone neutralizes the building's overwhelming mass and structure of the building into a refined atmosphere.